Black Swallowtail Egg.....the first time I saw one was at a garden center on some parsley. I bought the plant and that began my adventure with raising Swallowtails!! Before we get to the egg...I thought it might be fun to share with you an interesting behavior of the Black Swallowtail butterfly known as hilltopping. 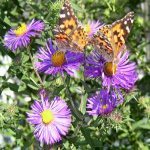 These butterflies fly up hills and ridges, increasing their numbers in these areas. This makes it easier for the males and females to find each other. The males often "patrol" these areas for hours chasing away other male "intruders. I have used parsley, fennel and rue. Rue is the favorite in my garden. 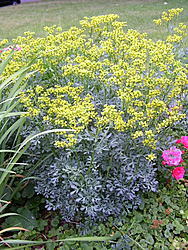 (Left)This is a plant in my garden which is just beginning to bloom with small yellow flowers. Rue has been know to irritate some people's skin, so beware. I have not had trouble with this. If you want to use parsley to feed the caterpillar once it emerges, buy a bunch in the produce section of the grocery store. Cut the ends a bit and place in water. 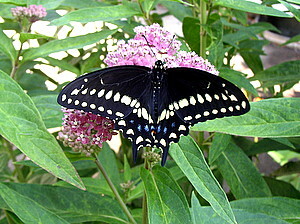 The Black Swallowtail egg is cream-colored and round. 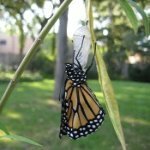 In about 4-8 days, the egg will turn black.....and the caterpillar will emerge. I usually cut off the branch of Rue with the egg on it. Then, I put it in a narrow-necked vase with water. 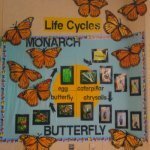 Check out my set-up for Raising Monarchs. The next phase of raising Black Swallowtails is very interesting.....the Caterpillar.